Recently I’ve had the exciting opportunity to work with a number of new clients and most of them fairly new to blogging. They needed assistance either setting up their new blog or tweaking it to look more professional or make it look unique. When working with new clients, the topic of Search Engine Optimization (SEO) almost always seems to come up, and thus I generally end up providing some SEO basics for blogs for them. Rather than explain the same concepts multiple times, I thought I would write up a comprehensive guide that would walk both my clients and you through SEO Basics for blogs. SEO sounds really complex and mystical, but it’s not. Honestly, it’s pretty straight forward. 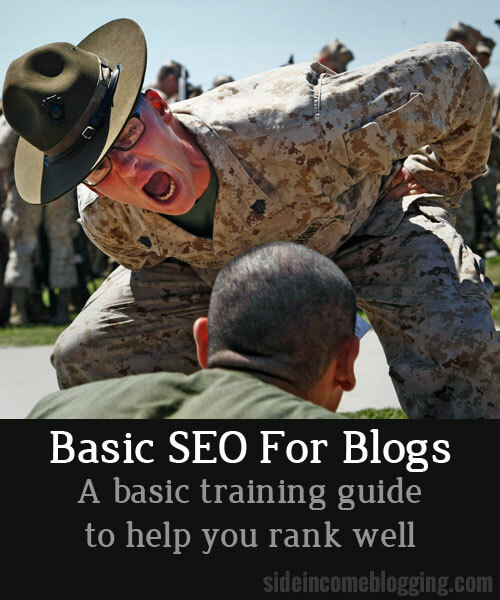 Every blogger needs to practice basic SEO techniques, and this guide will help you do just that. One of the most common mistakes new bloggers seem to make is not understanding SEO and the important role it plays in the growth of a blog. Search engines can drive a large amount of traffic to your blog or website and search engine visitors have a high click through rate on ads and affiliates. While SEO can be somewhat complicated, especially if you are trying to rank in a top 10 position on Google SERPs (Search Engine Result Pages), the basic principles of SEO are really pretty straight forward. Following these basic principles can, over time, get your blog and articles ranking high with only a small amount of effort. With that said, here are some SEO basics for blogs that you should very clearly understand and practice before you press the publish button on your next article. The most basic and most important aspect of optimizing your blog and articles for SEO is understanding keywords. Keywords are the words that users of Google key into the search field in order to find something they are looking for. Multiple keywords together are often referred to as a “keyword phrase”. For every page on your blog, you’ll want to determine what the “target” keyword or more likely the target keyword phrase is. This will be the primary keywords, that when keyed into the Google search engine, your article will show up for. In addition to the target keywords, you’ll want to use other keywords in your articles as well. These other keywords are often referred to as “long-tail” and secondary keywords. These are often keywords with lower search volume. But remember, ranking for lots of small search volume keywords can add up to lots of traffic over time. The best way to find keywords is to use a keyword research tool. I personally use Market Samurai in conjunction with Google’s Keyword Planner tool. But I’ve heard great things about Long Tail Pro as well. I generally use Google’s keyword planner tool for high level research, then tools like Market Samurai or Long Tail Pro to dig deeper, find related long-tail keywords and track rankings. Many new and experienced bloggers get a little confused here. Your blog’s main landing page should be set-up to focus on a particular keyword phrase. The main blog page will be configured to focus on that main keyword phrase. For side income blogging the key phrase is “side income”, but frankly that isn’t a real focus for me. I focus mostly on long-tail search engine traffic to my pages and articles, like this one. Your articles and pages are where you should spend the large majority of your SEO time. Your articles and pages should generally have different target keywords than you main site, and optimizing your articles for those target keywords is the real focus of this article. Remember too, that a very large percentage of your traffic will not land on your home page, but on individual posts and pages. This holds true for all types of traffic, including search engines and social media. From here on, if I say “article” or “post”, that includes pages as well. Articles, pages, posts all work the same from an SEO perspective. I’m not a big fan of plugins, but one that I always install on my blogs and niche sites is WordPress SEO by Yoast. This plugin configures a number of SEO basics automatically for you and allows you to put in all of the necessary items to fully optimize both your blog and your articles for SEO. WordPress SEO makes adding the appropriate SEO information to your blog and articles easy. The plugin also helps you optimize your articles using a a red, yellow and green visual indicator. I’ll tell you how to use WordPress SEO as we dive more into the basics of SEO below. Probably the single most critical SEO item for your blog article is the post title. The post title is a key indicator to search engines on what your article is about. First and foremost, your post title should tell potential readers exactly what your blog article is about. Your post title should also include your keyword, and as close to the front of the title as possible. If you have room, you can even include secondary keywords in your title. Your post title is set when you create or edit a post at the top, right under the “Edit Post” heading. The post title you use also sets the contents of the title tag for your post. The title tag is what search engines use to determine the article title. Many SEO plugins, including WordPress SEO append your site name onto the end of your post title in the title tag. I have seen evidence that removing your blog name from the end can increase your search engine rankings and click throughs. I am personally experimenting with this strategy now on a few niche sites I run. To remove your site name from the end in WordPress SEO, login to your admin console, click SEO>>Titles and Metas. Then click on the Post Types tab. Remove the text: %%sep%% %%sitename%% from Title Template field on each of the post types and save your settings. Permalinks define the URL for your post. By default, WordPress permalinks are not SEO or user friendly and look something like this: sideincomeblogging.com/?p=42. Not sure about you, but p=42 is pretty meaningless, unless we’re referring to Douglas Adams here. If you’ve already published content for any length of time and your posts have already been indexed by Google, be careful changing your permalink format. Once you do, Google will no longer be able to find your posts because the URL changed. You can fix this by installing a 301 redirect plugin. These plugins allow you to specify the old link and the new link and allow Google to find the new URL for each of your posts. There are a number of various 301 redirect plugins that work just fine, so take your pick. Don’t let the 301 confuse you either. 301 is just a special type of return code that basically says “Ah, that content you’re looking for is no longer here, but you can find it over here instead“. Many blogger’s don’t realize that they can edit their post permalinks. Your permalinks should be as short as possible and always contain the target keyword phrase. Use dashes to separate the keywords, avoid any special characters and don’t use spaces. I even avoid numbers and generally spell them out. To edit your permalinks, just press the edit button that is just under the Title area and next to where the posts URL is shown on the Edit Post or Edit Page screens. Do not include spaces in your permalink and I recommend only using alpha characters. This is where the WordPress SEO plugin really shines and will really help you out. Your keyword phrase should be used throughout your content where it makes sense. But be careful, don’t overdue do it! Your target keyword percentage sound be 1-2%. Google is getting really particular about keyword stuffing, and while many SEO experts recommend 5%, I believe less is more. Keep your keyword density to 1-2% and use lots of variations on your keywords. Market Samurai and Long Tail Pro are both excellent tool for getting keyword variations and long-tail keyword ideas. I frequently run my article keywords through Market Samurai to get ideas, then go back and revise my article to tweak the keyword use. In fact I did just that with this article before pressing the publish button. Additionally, in your content make use of sub-headings to not only make your articles more readable, but to increase SEO. Using keywords, and keyword variations in sub-headings helps your SEO, as Google can give more credit to subheading text than regular paragraph text. Many experts will also tell you to bold some of your keywords, while that may have worked a few years ago, it doesn’t make any difference now. Enter your keyword phrase into the WordPress SEO. Yoast’s plugin will even suggest keywords for you, but unfortunately it doesn’t show search volumes, so the feature isn’t really helpful. After entering the keyword phrase, Save your post. WordPress SEO will update the color indicator and show you, in the plugin area, recommended changes you can make to further optimize. Again, the plugin uses red, yellow and green text as a visual indicator of how you’re doing. Make the changes it recommends, and also navigate to the page Analysis tab, where even more suggestions are presented. You’ll want the main color indicator to be green before you publish your post. Interlinking your content and linking out to related content on other blogs and web-sites that are well respected can also add SEO value. Interlinking provides value to your readers and thus Google will give your article additional credibility. Again, like keyword use, don’t overdue it and when interlinking to common interlinked articles, make and effort to vary your anchor text, otherwise your links strategy could backfire on you. Personally, I avoid interlinking my various blogs and websites altogether. Every so often I might throw in a link if it makes sense, but I always “no follow” the link. Google has come down pretty hard lately on link placement, and it wouldn’t be hard for them to recognize that all of my sites are owned by me. Just a risk I choose to avoid. The use of images in your content not only enhances the article and provides visual interest, but images can also enhance your SEO. Using your target keyword phrase and secondary keywords in the image file name, image title and image alt fields are great ways to get extra keyword focus to your article. An additional benefit is that image searches will also find your images and link to your content. Let’s say I’m writing a post on “Hiking in the Blue Ridge”. My target keyword phrase is “hiking blue ridge”. To help my SEO, I should start all of my image names with hiking-blue-ridge. So something like this: hiking-blue-ridge-trail.jpg, hiking-blue-ridge-waterfall.jpg, etc. Additionally, the title and alt description for these images should start with “Hiking Blue Ridge”. Fortunately WordPress makes this easy and when you add an image to the media library, adding the title and alt fields are right there on the screen. Need help finding free images to use on your blog? Check out my resource on finding and using free images for your blog. The meta description section is one of the most frequently forgotten SEO gems. The meta description not only allows you an opportunity to use your keyword phrase, and gain an SEO benefit, but the meta description also serves as the “elevator pitch” for you post to encourage search engines users to click through. Is there a author picture associated with the image. This is called Authorship. I’ll dive into it more below. The Post Title – Does it catch the searchers attention and draw them in? The meta description is your chance to tell the search engine user what your article provides and what value it ads. Always put a meta description for your posts. If you don’t, Google will determine one. Often times the one pulled from your blog content is not optimal. Pay attention to the maximum length guidelines the WordPress SEO plugin provides, and make sure you use your keyword phrase in the meta description. I recommend only using it once. Don’t waste your time here. Some years back, Google used Meta keywords to help determine your articles content. Due to meta keyword abuse, Google stopped using this a few years ago and now most likely ignores this field. If anything, putting values here, or at least too many values could possibly hurt you more than help you. Just leave it blank and the WordPress SEO theme doesn’t even provide for a way to enter it, although many themes still do. Google Authorship allows you to tell Google which posts are yours. This is done using the rel=”author” attribute in a link back to your Google + profile. Within Google+ you link out to the blog as a contributor. These two things combined allow Google to know that you are the author of a particular post. While still not fully proven, most SEO and Google gurus feel very strongly that having Authoriship set-up for your blog can and will increase your search engine rankings. You can read more about Authorship and how to set it up in this article by Mark Traphagen. If you use the Genesis theme or any genesis child theme, Authorship is supported out of the box and literally takes all of a few seconds to enable. Google+ is an outstanding, fun and powerful social media platform. Given just that, Google+ is a great platform to promote your content on. Links shared on Google+ are “follow” links, meaning they have SEO value add. Social popularity of content is a key indicator to Google on how to rank your content. Given Facebook and Twitter do not share their data with Google, Google created their own social platform to obtain this information. Google can track the type of content you curate, enjoy and promote. This allows Google to learn you interests, and more importantly your expertise. So in my case, if become known to Google+ as a blogging expert, they can theoretically rank my blogging content higher in the SERPs. There is currently no evidence this is occurring yet, but it’s certainly feasible. Google uses re-shares of your content as factors in it’s overall ranking algorithm. While not officially confirmed by Google, most experts agree this is a factor. +1s have been confirmed by Matt Cutts to not be a factor at the present time. Personally I find this a little hard to swallow, but who knows. Google Communities provide additional exposure for your content, and serve to further assist Google with determining your area(s) of expertise and knowledge. Again, more possible input into their ranking algorithms. Being active on Google+ is a win/win all around. Not only do you get to participate in an outstanding social media platform, you get SEO benefits from it as well. If you aren’t on Google+ now, you need to be. One way to jumpstart your site and let Google know it’s out there and about all of that great content you have is to register your blog with Google Webmaster tools. This not only has the benefit of letting Google know you’re out there, but also gives you some valuable insight to how Google sees your blog. With Webmaster tools you can see crawl errors, back links, the type of searches being done that get people to your blog and more. Additionally, if Google has a problem with your blog, they will let you know via Webmaster tools. You can read a detailed walkthrough on how to register your blog here. Link Building for years has been the number one activity any blogger or SEO expert could do to get a website to rank higher in Google’s search results. Incoming links from credible sites to your blog can make huge differences in where your articles are ranking in Google’s result pages. The problem is that people quickly figured this out, and quickly. People starting doing all types of things to get links, including even purchasing links on high page rank sites. Fortunately, the days of paid links are over (although I made a lot of money from them). These days, Google will nail you hard for running paid links. Google and their web spam team are very aware of all the link building efforts going on by people, both “white hat” and “black hat”. As a result, I raise a huge yellow caution flag at intentional link building. You absolutely can and should build links, but you must be very careful how you do it. Build links too fast, it hurts you. Build links from credible sites that Google doesn’t like, it hurts you. Even guest posting, the ultimate in win/win for link building, exposure, and helping other bloggers out is getting a close review from Google. I don’t go out and do something just for the sake of a creating a link. I post my articles on social media to gain exposure and traffic, the link is secondary. I don’t write articles for article repositories anymore. I guest post still, but only include one link, and always make sure I vary the keywords. I’m very selective about where I guest post, and try not to post to those sites often. I don’t interlink my own sites together even when they are related. I disavow links often, if they come in bulk from one site or from a source even think might not be credible. Side Income Blogging currently has more than 12,000 inbound links. I’ve done very little to build links. Google and it’s users love fresh content. Fresh content is content that is “hot off the presses”, meaning it’s been published recently. I’ve been reading a number of articles lately from SEO gurus that show concrete results that the fresher your content is, the higher it will rank. So what does that mean? Publish content often. The more you publish articles the higher your blog and it’s articles will rank. If you have an older article that did well, but isn’t ranking as good as it used to, freshen it up and update the publish date. This probably won’t last for too long, but right now Google gives significant preference to “freshness”, almost too the point of being overboard. I saved the best for last, the single most important SEO tip I can give you. This one tip that trumps them all … Are you ready? Sure, keywords, title tags, meta descriptions and all of that help, but without great content you still won’t rank. I’ve seen great content on page one of Google that wasn’t search engine optimized at all, but was ranking in a top spot! Google is smart, and getting smarter. They are quickly approaching the point where they don’t need all of these tags and optimization items in order to rank your content. They can read your post, and understand your content, and are getting better at it everyday. Couple that with feedback and input from Google+ and you have a very strong input set to pretty accurately rank an article without all of the SEO stuff. Now, does that mean SEO is dead? Certainly not, and it will be around for sometime yet. But change is on the horizon, and I see it occurring each time Google roles out an engine change. Doing these things will cause that content to go viral on social media, be linked to by lots of high quality websites and blogs (thus building back links) and because of it’s popularity, will rank well on Google. Important: Always write for people, not search engines. Write for people, tweak for search engines. If you write great content and do all of the SEO Basics I’ve outlined, you’ll be well ahead of the majority of other blogs and websites on the internet. While I certainly can’t guarantee you’ll rank in the #1 sweet spot for that keyword phrase you want, I can guarantee you’ll rank higher than most of the other people trying to rank. I always strive for diversity in my traffic, that way one when falls, another generally picks up. With that said though, I focus on search engine traffic more than any other. Why? Search engines can drive the most consistent and long term traffic to your blog. Oh, and by the way, search engine visitors have a much higher chance of clicking on ads and affiliate offers as well. Another win/win, more traffic and more money. Did I miss something? Have an SEO technique you use that I didn’t include? Add a comment and add value to this article! – Use Headings to break up your content. Not only are keywords within your headings helpful for SEO, but also your page will be easier to read and scan. – Don’t forget to optimize your images. Little things like the alt tag, title tag and even the filename can have keywords that will definitely help with your SEO efforts. The last point about writing great content, though, is the key takeaway. Start there, use these other little tricks to make it all stand out. excellent post. One thing I might suggest, is in your Interlink and Linking Out section… point out that it is best if you link out to more credible and relevant sites like wikipedia for example. From what I recall, google seems to favor that. I really enjoyed reading this article… it was a great review and it helps my confidence moving forward as their were a couple things I wasn’t sure if I was doing correctly or not. Thanks for the reinforcement and it’s much appreciated! Fantastic guide Larry. One thing I might add to the keywords section is the importance of learning how to do proper keyword research. Although maybe not for total beginners, and this topic is easily an entire post on it’s own, it is really important (as you know) to find those low competition keywords that actually get searches. People could apply all of your tips in this post and get absolutely no results if they are optimizing for bad keywords. Thank for the details tutorials for SEO. I think it’s important to understand the basic needs and then apply them to each post. I think what have been missing in few months on my blog is fresh contents. Without fresh contents, the traffic from search engines will drop. And since my blog generates revenue from Adsense, I need more visitors from searches. Great point Santel, freshness and consistency definitely play a big role in rankings. The more often you write, the better you will rank. Excellent point Matthew. I have a article I wrote up about that I’ll add a link to up in the keywords section. Jaime, so glad you found it helpful for you. Thanks for your comment. Very true Adam, I’ll get that added as well. Thanks! Thanks Stephen, I added the information on images. Met to get that in their the first time, but seems I forgot. What a great article, Larry! I need to tweak my word press site’s with all the tips you have given here – a HUGE thanks! I am a rank newcomer to this and have found the contents to be really informative and useful. I am contemplating to start writing my blogs, and hence doing my search on “How to do it” and get it right ASAP..My knowledge of It is limited to being an user, but my areas of interest are Personal Finance, Politics, Movies and Sports..So wondering how do I go about expressing my views and how and where do I start? I will indeed appreciate a great deal if I can get some more information or initial baby steps as a prelude to going all out. Minor point. More shares will happen when you don’t promote someone’s competition. =) Otherwise a fantastic article. Hey Allen, not sure I get your point. Did I make an mistake in the article?